The Apple Mac mini (2018) was a long time coming, but it’s been worth the wait. This brilliantly-designed small-form factor computer packs in some impressive specs and pulls off neat tricks to do so. It’s not cheap, but it’s priced very competitively compared to other small PCs, especially considering what it’s capable of. Apple didn’t forget about the Mac mini, and this long-awaited refresh is proof. While it’s always been a fan favorite, it’s been more than four years since we saw the last Mac mini, but with the 2018 model, the tiniest Mac has been brought into the modern age. Apple is saying that the new Mac mini is up to five times faster than the 2014 model, so it was worth the wait on paper. This performance increase is thanks to some impressive spec bumps, including a hexa-core Intel Coffee Lake desktop processor and up to 64GB of RAM. It shouldn’t come as too much of a surprise, then, that Apple is hailing the Mac mini as a media creation machine. The Cupertino behemoth claims the new Mac mini is up to 30 times faster at HEVC encoding than the 2014 Mac mini. There’s also plenty of connectivity on the back of the device, including four Thunderbolt 3 ports. So, was the Mac mini worth the wait, or should you wait to see if there’s a Mac mini 2019? We’ll take Apple’s tiniest Mac for a spin to see if it’s worth it this year. This year's Apple Mac mini starts at $799 (£799, AU$1,249) and tops out at $1,099 (£1,099, AU$1,699) with the preset configurations. If you change any of the components, the price will also change, which gives you some flexibility when it comes to balancing power with budget. If you need a Mac for creative applications, the new Mac mini is a more affordable route, compared to something like the iMac Pro, which will set you back a whopping $4,999 (£4,899, AU$7,299) for the base model. More interested in the Mac mini as a small PC? Then the nearest rival is arguably the Intel Hades Canyon NUC, which is a powerful, yet barebones, mini PC that runs either Windows or Linux, and costs $999 (about £710, AU$1,302). That makes the Apple Mac mini seem pretty value-oriented, particularly when you realize you’ll have to buy storage, memory and an OS separately for the NUC, which adds extra expense (though you don’t need to pay for Linux, obviously). Fans of the compact, no-nonsense designs of previous Mac minis will be pleased to learn that the new Mac mini pretty much keeps that intact, with the same small, square-ish metal design that measures 7.7 x 7.7 x 1.4 inches (19.7 x 19.7 x 3.6cm) and weighs slightly heavier than the last Mac Mini at 2.9 pounds (1.3kg), compared to the older Mac mini’s weight of 2.6 pounds (1.19kg). Within the same dimensions, the Mac mini manages to have more powerful hardware than ever before, thanks to a redesigned thermal architecture that includes a bigger fan, expanded vents and an overhauled power supply. Apple has made some small changes to the Mac mini’s design – it now comes in the same Space Grey as the iMac Pro – though it’s the only color option this time around. Apple also claims that the new Mac mini is made of 60% post-consumer plastic, mostly in the base, with the chassis being constructed from 100% recycled aluminum. The move to a PCIe solid state drive (SSD) for storage doesn’t just make the Mac mini faster, it means it runs cooler and quieter as well – essential for a small form-factor PC. Ports-wise the Apple Mac mini (2018) comes with four Thunderbolt 3 USB-C ports, an HDMI 2.0 port, two USB-A ports, audio jack and Gigabit Ethernet, along with a 10Gb Ethernet option. On the back corner there’s a power button and the increasingly rare (for Apple products, at least) 3.5mm headphone jack as well. With just one HDMI port, you're going to have to either upgrade to a Thunderbolt 3 monitor or make do with an adapter if you want to plug in more than one monitor. Considering the Mac mini is built as a creator's tool, multiple monitors are often a must, so many people will have to buy extra accessories. The good news is that with Thunderbolt 3 you'll be able to run two 4K displays at once, and you'll still have two ports left over – maybe one for an external graphics card solution, which the Apple Mac mini (2018) supports. As per usual, the keyboard and mouse aren't included, so there's another two accessory to factor in to the overall price. All these ports are kept at the back of the Mac mini for a clean look, which keeps wires from sprawling all over the place. It shouldn’t come as a surprise, but the Apple Mac Mini isn’t easily upgradable, unlike mini PCs like the Intel NUC or Zotac ZBox range. This means when the Mac Mini starts to show its age, you won’t be able to open it up and throw in some more powerful components – besides the memory. For anyone coming from a PC background where upgradability is essential, this will be frustrating, but for anyone used to Apple’s way of doing things, it won’t be too surprising. There’s also a few things Apple has done to mitigate the user’s inability to upgrade easily. First of all, you’re able to configure the Apple Mac mini (2018) quite extensively, allowing you to upgrade various components before you buy, ensuring you get a Mac mini that best suits your needs and budget. It’s also worth noting that thanks to the modern technology in the Apple Mac mini, you should hopefully not feel the need to upgrade for a while yet. And, considering the gap between Mac mini releases these days, that may be for the best. Overall, we’re pleased that Apple has maintained the small size of the Mac mini while filling it with more powerful components and plenty of ports, though creatives that want multiple monitors may need to think carefully thanks to the single HDMI port, and lack of any DisplayPorts. The Space Gray color looks great, as it does on other Apple products, and the 100% recycled aluminium case is a welcome move, which also keeps the Mac mini feeling sturdy and robust. The new Mac Mini has desktop-grade 8th-generation Intel Coffee Lake processors in quad- and hexa-core models, so we had high hopes for the computing power. The new square shaped desktop delivers five times the amount of performance over its predecessor, at least according to Apple. Because the Mac Mini is aimed at creatives, which typically count on intensive software and editing large files, the 2018 Mac Mini needs to be able to keep pace, more so than any previous version. The quad- and hexa-core Intel Core processors with Turbo Boost speeds of up to 4.6GHz, and support for up to 2,666MHz (which is four times what the last Mac Mini could hold) will definitely keep the 2018 Mac mini feeling fast and responsive for most tasks, and allows it to handle multiple tasks at once, thanks to the huge amount of memory on offer. The latest Mac mini comes with the Apple T2 security chip, which comes with an SSD controller with on-the-fly data encryption for "industry-leading security". The T2 chip also features HEVC video transcoding that's up to 30 times faster, which will be great news for video editors who are interested in using an Apple Mac mini for their creative work. The only place the Apple Mac mini (2018) is let down, specs wise, is with the Intel UHD 630 integrated graphics. We would have much rather seen some form of discrete graphics, and anyone using the Apple Mac mini for graphically-intensive creative work, such as video editing and 3D modelling, may find the integrated graphics a bit limiting. However, those looking for a boost in performance on this front can always plug in an eGPU. We got to see how flexible the Mac mini (2018) is with a Black Magic eGPU plugged in. Editing raw 4K video files and adding effects on the fly in Final Cut was impressively smooth for such a diminutive machine. Of course, the external graphic card was doing a lot of heavy lifting, but it was a good indication of how the new Mac mini can be used in creative work. Apple also showed us an interesting setup where a single Mac mini (2018) was connected via a network switch to a network cluster of five Mac minis (piled on top of each other). By putting the 10Gb Ethernet port on the Mac mini (if you choose that option when purchasing the Mac mini) to good use, we saw how you can offload intensive processes (such as rendering video) to these other Mac minis. The process of doing this is impressively simple in Final Cut, where it was a matter of opening up a menu and selecting the attached Mac minis. Once done, the tasks were completed by the other Mac minis, while the main one could still be used for working on without any noticeable impact to performance. Perhaps most impressively, the stack of five Mac minis remained pretty much silent, even when working on those intensive tasks. For anyone who has used multiple PCs at once on complex projects and had to put up with the sound of fans blasting off, this will be a welcome solution. Of course, there won’t be many people who will be using a pile of Mac minis like that, but it’s a good demonstration of how versatile the new Mac mini is. In our day-to-day use we were really impressed with the new Mac mini, which felt fast and responsive when running macOS 10.14 Mojave. Apps opened and closed instantaneously, and even more challenging processes, such as video transcoding, was accomplished quickly – and silently as well. What we really like about this new Mac mini is that Apple has produced a powerful and versatile mini PC that’s compact enough to be easily carried around, or hidden out of view behind a display. In our benchmark tests, the Mac mini doesn’t hit the highs of professional-grade Apple devices such as the MacBook Pro or iMac Pro, but it still performs very well, especially in the multi-core tests thanks to that quad-core Intel processor. If you go for the Mac mini configuration with a hexa-core processor, expect even better results. It’s also worth remembering that the Mac mini is a fair bit less expensive than either of those other devices, even when you factor in the fact that you need a monitor, mouse and keyboard for the Mac mini. Compared to the previous generation of Mac mini, there’s no competition: this year’s Mac mini blows it out of the water, performance-wise. If you love your Mac mini and have been waiting for an upgrade, then you’re going to be very pleased with the new Mac mini. Many of us had been hoping that Apple would release an updated version of the popular Mac mini for years now, so we were excited when the Cupertino company finally announced the new Mac mini earlier this year. However, this isn’t just an afterthought, or a quick and dirty update to keep the more vocal Mac mini fanatics quiet. Instead, we’ve got a hugely overhauled Mac mini that in some ways goes way beyond what we had been hoping for. This is a very accomplished little machine that packs some brilliant modern features and components for a level of performance that puts many other small form-factor PCs to shame. Apple has acknowledged that the computing landscape has changed since the last Mac mini was released. Back then, the Mac mini was designed with casual users in mind, as well as an accessible device to win over people from Windows. 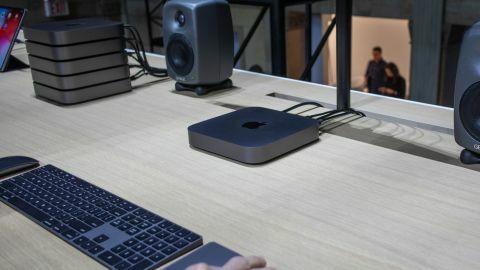 With the rise of laptops, and with the entry level MacBook now acting as that crossover device, Apple has pitched the Mac mini towards creatives and professionals. That might sound crazy, but you know what? It works. This is a brilliant little machine in its own right, but paired with an eGPU (or even a few extra Mac minis) and you’ve got a powerful machine for heavy-duty tasks. By being scalable in this way, as well as allowing you to use your own monitor and peripherals, you’ve got a very flexible device. It’s also very competitively priced compared to other small form factor computers that offer similar levels of performance. We’ve been waiting a long time for an updated Mac mini, but in our view it has definitely been worth the wait.